Sometimes I need “a little help from my friends.” The Beetles had it right, and with a little help from my sister, I was able to fly into Minnesota for a last minute meeting. It doesn’t get any better than Spring in Minnesota–like a fine wine, the weather is balanced with the longer days; the air is crisp, but doesn’t border on cold; the sky is blue without the haze of humidity or mosquitoes, and people are just nicer, dontchya know? Greeting me at home after a nice swim was also a bottle of Shiraz from Barossa Valley my sister had purchased the last time I was on the front. As I’ve mentioned in an earlier post, I love me some reds from Barossa–the heat produces some lovely, and I think, complex, wines that are a great deal. 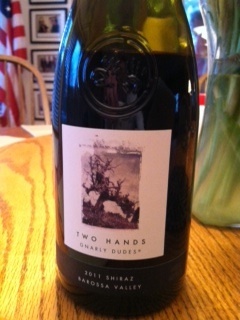 The Wine: “Two Hands” has the nose of a jammy s hiraz–red, baked plum, blackberry notes, and oak–if you get your nose deep down into the glass. Upon tasting, though, the first subtle note is the sharpness of the alcohol (14.8%) followed by the black fruit notes of blackberry, a little baked plum, and slight pepper and vanilla flavors. However, the body is medium-light; the flavor only lingers slightly, and the big, bold summer jam in a glass doesn’t come through. It loses the kaleidoscope of flavors I love in a Barossa Valley wine, and wish this was a little more bold, had more dimensions, and danced a little more on the palette. But, sometimes as the saying gets tweaked, Two Hands are better than one, and this is the case, especially if given as a gift. (I believe she was able to get this at Costco). This is not a wine I would write home about, but good thing I am already here to enjoy it. Have a glass, or two, especially if it’s around, but don’t miss the workout.